With all due respect to Ricky Martin, I am living La Vida Loca. I’m just not living his. I once summarized my career aspirations in a single phrase: “Education is my wife, but Photography is my mistress”. When I was growing up, my heroes weren’t the sports stars of the day. 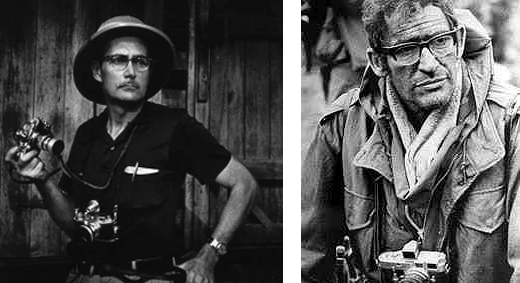 I would have given anything to have been a great photographer like W. Eugene Smith (left) or Larry Burrows (right), a Life Magazine photographer featured in a film on photojournalists. I remember the intense interest he took in a young boy who lost the use of his legs from the explosion of a hidden land mine. He was sent to America to recover, and was now returning home to a Vietnamese village ill-equipped to accommodate his crutches and wheelchair. His struggles, his frustration, and his eventual resignation to his shattered life brought into focus the depth of the tragedy in Southeast Asia. Burrows, along with several other journalists, would die in a helicopter crash in Laos in 1971. Passage. I am nearing a point in my life when I’ll be free to “run off with my mistress”, better known as retirement. And quite by accident, I got a head start in renewing my love of photography. 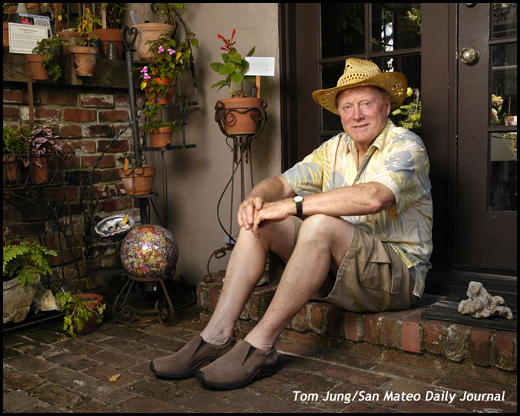 This is my second year as a photographer for the San Mateo Daily Journal, a relationship that started when I was asked to send the paper a photograph of students involved in a letter writing campaign in 2010. After I sent the image, I was contacted by Susan Cohn, one of the Journal’s editors, and asked if I would consider taking photos, pro bono, for the paper. Over a quick cup of coffee, I showed some street photos from San Francisco’s Carnaval, and soon afterward I was given an assignment to photograph some opera fans during a Wagner Costume Contest. The submitted shots never ran, in part because I could not establish a San Mateo connection. Let’s address the pro bono issue. My agreement with the paper gave me the freedom to choose only the assignments of interest to me. In exchange, I would receive access to press previews of major museum exhibits and special events in the Journal’s service area. I have had three opportunities to photograph President Obama during visits in the bay area. And while my college photography classes gave me the knowledge, my time in the field is giving me experience. I look upon this as an extended internship. Sure, there’s no “spot news” photography, but frankly that’s of little interest to me anyway. In the end, I've will have amassed a body of work I could not have obtained any other way. My first published photo was from a charity bike ride called Bike 4 Breath in Foster City. The photo was little different from the customary “picket fence” photo of bikers lined up beneath an event banner. It showed two competitors in the act of pinning race numbers on one another. In also Incorporated an on-camera flash to provide some specular highlights and a bit of visual "snap". It was a candid photo, in that neither person appears aware of the camera’s presence. Yet all of the visual elements point to a bike race, and judging from their smiles, a fun one. The image has stood the test of time, as it can still be seen hanging on the paper’s Facebook Wall. 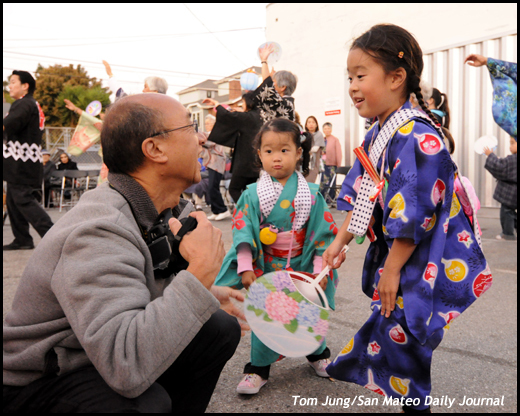 Subsequent assignments included San Mateo’s Oban Festival (above) and a charity garden tour (below). After a while, it became apparent that I enjoyed making editorial photographs of people. The variety is certainly there, as is the challenge of trying to transform mundane activities into something visually interesting. Finding, or making, an interesting lighting environment adds to the excitement. Working on location gives a photographer a chance to test his or her knowledge of lighting, exposure, and composition. Editorial photography also allows me some latitude in how I work with the subject, since my job is to illustrate a concept, not necessarily a spontaneous moment in time. And finally, the subject is not the client. If I make a photograph that my editor likes it, the job is done, in spite of what the subject may think. Get Real. So again, I ask my mistress “Is there a living to be made in photography?” For editorial photographers like myself, the answer may well be “no”, since the career’s demise is linked to the general decline in the print media. At my paper, most of the photographs are taken by the writers themselves, who now get their interviews and their images at the same time. Simply stated, a good writer with a digital camera is more valuable than a good photographer with a pencil, technology having made acceptable photos much easier to create. Collaborations. There will be times when a story becomes a collaborative effort between the writer and the photographer. 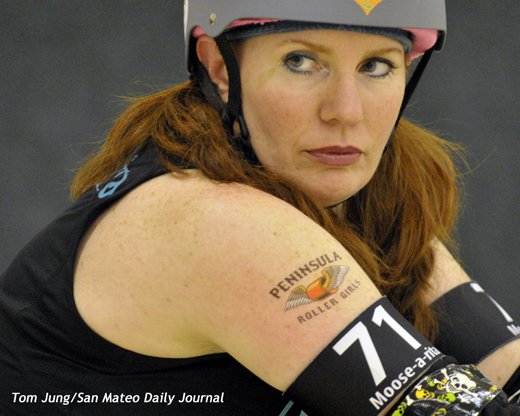 I had a chance to work with Bill Silverfarb, a staff writer at the Journal, providing images for a story on the Peninsula Roller Girls, a confederation of roller derby teams competing on flat track rinks. He had requested five photos with particular attention to two specific competitors who he interviewed at great length. 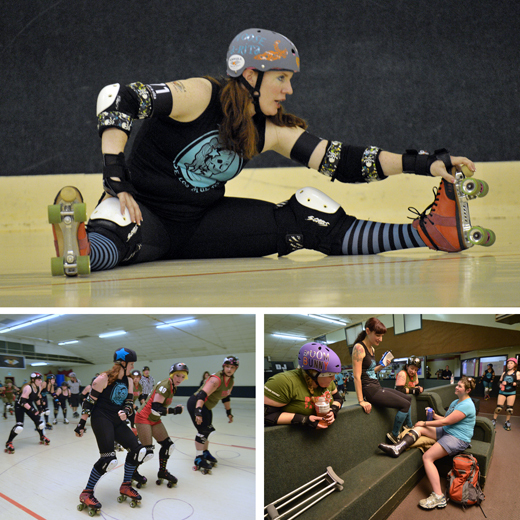 Here are the three chosen photos, arranged as they were in the June 17 issue. Page Space. The passing of Life Magazine brought an end to the photo-news magazine as we knew it. Without any hard evidence, I estimate that the ratio of image area to print area ran about 50/50. The National Geographic, probably the last of its kind, has a similar ratio. But newspapers as a whole probably average a 20/80 picture/print ratio when it comes to the paper overall. In Bill’s article, the image to text ratio is slightly less than 50/50, an encouraging amount of image space. And while I know that one can’t extrapolate the data from a single article to the entire paper’s real estate, it does show that images are important enough to be included, so long as they come at an acceptable price. I like to think that these photographs (printed front page, above the crease) added some visual appeal to the day's issue. And yes, there is a place for photographs that add depth and interest to the articles. But pay a premium for them? I have my doubts. But so long as I can afford this indulgence of personal resource, it will be a great ride. Truly, La Vida Loca. I leave you with the photo I wished the paper had chosen.